The Date Created field is still not appearing in images exported from Aperture, but most of the other fields that were not appearing in Adobe Bridge or Photoshop are now appearing properly. However, the Ampersand "&" character issue described below has still not been fixed and will affect any images saved as DNG files, or where the metadata is exported and saved as an XMP sidecar (.xmp file). I've updated the Aperture 3 Exported Fields online spreadsheets with results of the most recent tests. It's not clear whether this was an issue that existed in previous versions, but I have discovered a new problem based on some troubles that photographer David Gordon was having with exported XMP sidecar files generated by Aperture 3.1 on a MacBook Pro running Mac OS X 10.6.5. His resulting Canon Raw files (CR2 + xmp) were not recognised by Adobe DNG Convertor, PhotoMechanic, Adobe Bridge, or Lightroom.. The problem turned out to be with the use of the Ampersand "&" character. 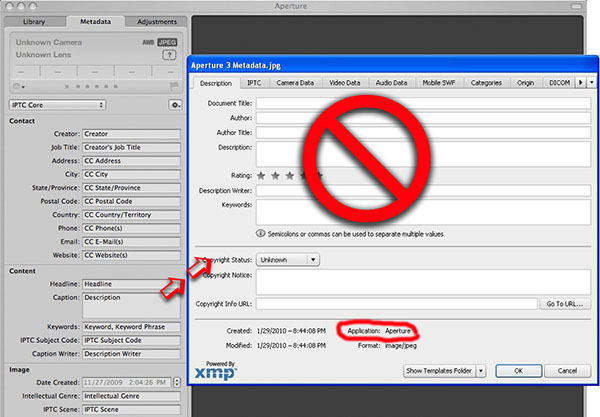 Based on the behavior in XMP file with and without the "&" it appears that Aperture 3.1 is not doing a proper to/from XML attribute parse on XMP data. Executive Summary: Don't use the "&" character when entering data into any metadata field in Aperture. Instead use "and" — and you will avoid this issue. Detailed explanation: If you are interested in why this causes a problem, it's important to understand that there are a number of characters that can't exist as values in metadata fields without being specially treated. This is because they are the same characters that make up the underlying XMP code (similar to HTML) and having them as values confuses the reading of the information. When David Gordon tried to read or process his CR2 + XMP combo, the applications tried to read the metadata in the XMP sidecar and when they encountered the "&" symbol, either couldn't make sense of the code and gave up; or couldn't read it at all because it wasn't valid code. In addition to the "&" characters such as the Greater Than ">" and Less Than "<" symbols are considered "illegal" in XML except to mark the beginning or ends of tags or to mark the beginning of specific character entity codes. In HTML the ampersand is assumed to begin an "entity" reference. When Aperture "writes" the XMP sidecar the "&" should have been stored as "&amp;" instead. When reading a metadata field that includes a "&amp;" the application decodes and shows the value as "&" and everything works just fine. Whether the Apple engineers assumed that no-one would ever enter a "&" into a metadata field, or simply forgot to write a routine into the Aperture software for those times when someone did use an "&" or other illegal characters and store them properly is anyone guess. I would hope that they are now aware of the issue and correct it in the next point upgrade. If you are interested in the trouble-shooting methodology used in solving this particular issue see the Apple discussion forum. Apple released OS 10.6.4 last week, with a note that this included a fix for "compatibility issues with IPTC metadata" among other things. The good news is that the update to OS 10.6.4 has fixed the problem which was causing all of the IPTC Core fields to not be visible when exporting TIFF and JPEG files. In addition, JPEG and TIFF images that had IPTC star ratings applied in Photoshop or Photo Mechanic,now retained those star ratings even after being ingested and modified in Aperture 3 (before being exported back out as TIFF and JPEG files). Lastly, there seems to be much less of a difference between image's metadata whether they are viewed in Bridge or in Photoshop (there were many more inconsistencies with versions of the OS prior to 10.6.4). The bad news is that the Date Created field is often not appearing in JPEG or PSD files. This is the case whether these were files containing existing metadata that were imported into Aperture or Raw image files that were only annotated in Aperture 3. TIFF files, however do have a date in the Date Created field, however in some instances it was appearing incorrectly in some applications (the date should have read March 6, 2010, but was showing as May 18, 2010 in Photo Mechanic). Additional bad news is that the Star ratings are not retained if you are exporting in the PSD format from Aperture 3. 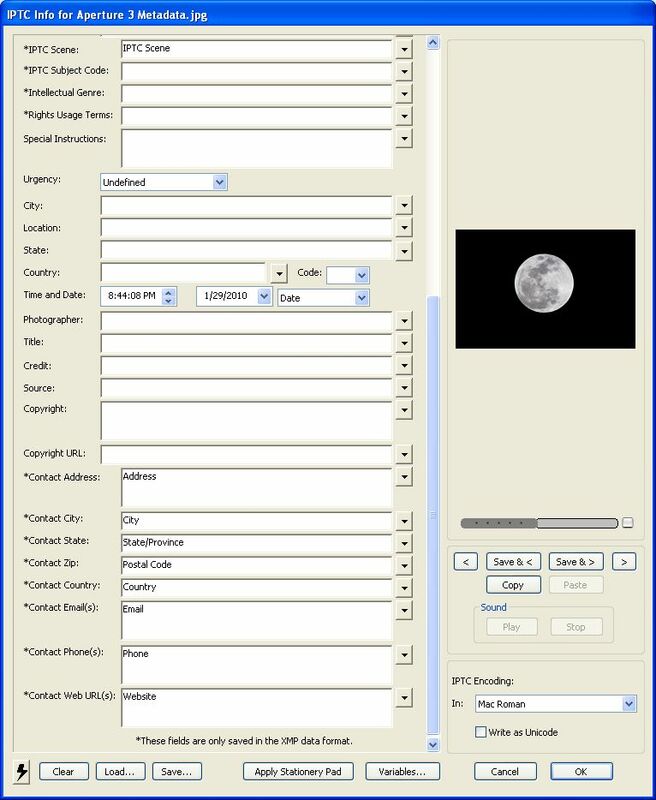 Files exported in the PSD format actually suffer a much greater fate than loss of star ratings, as they also lose all of the IPTC Creator Contact Info fields. Creator Contact Address, City, State/Province, Postal Code, Country, Phone, Email and Website fields are were no longer visible. 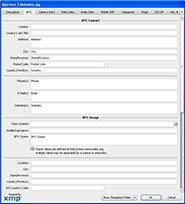 In addtion many of the IPTC codes (Scene, Subject and Genre) are not visible when viewed in Photoshop CS3 or CS5 or Photo Mechanic (but Genre is visible in Bridge). In the short term I would encourage Aperture 3 users to only export TIFF or JPEG files. And now the ugly news. IPTC Extension and PLUS metadata does not survive a round-trip through Aperture 3. I had tested this previously with Photoshop CS5 beta, but as that product had not been publicly released, I decided to hold off mentioning this in the February release. Here is the situation. If I bring an image that has IPTC Core, IPTC Extension, and PLUS metadata (all schemas are stored in XMP) only the IPTC Core metadata is preserved in the TIFF and JPEG images that are exported from Aperture 3.0.3 (and yes this is after applying Apples latest 10.6.4 update). PSD files do not have IPTC Extension or PLUS metadata, and only a portion of the IPTC Core metadata (as noted above). This is the case whether viewed in Photoshop, or Bridge. As Lightroom 3 now is supporting both the IPTC Core and IPTC Extension metadata schemas — and the IPTC will be releasing a new IPTC-PLUS metadata panel in early July that will give users the ability to add or edit IPTC Core, IPTC Extension and PLUS metadata in Bridge for Photoshop CS3 and CS4 — this is a serious issue that deserves further investigation. XMP metadata is supposed to be "extensible" meaning that it is flexible, and applications should preserve this information, even if they don't necessarily know what it is about. For comparison, I took an image contain all three of these metadata schemas, and opened it in Photo Mechanic. I then modified several of the metadata fields, and saved this updated information back into the file. When I went back to view this in Photoshop CS5, and Bridge for CS5 (and with the new un-released IPTC-PLUS metadata panel in Bridge for CS4), all three of these metadata schemas were preserved. I would expect Aperture 3 to work the same way, but instead the result is ugly and Apple get's a "does not play well with others" score from me. The details of the original article as posted in February are below. I've updated the Aperture 3 Exported Fields online spreadsheets with results of the most recent tests. I was initially enthused to hear that Apple's new version of Aperture (released February 9, 2010) would be supporting XMP. I had been noticing the incremental improvements within Apple's Preview program as more and more XMP fields became visible. My understanding is that in order for Apple programs to support XMP, this functionality had to be available at the OS level first. With these advances known, I had hoped that the next version of Aperture would be able to fully incorporate XMP support, and it has. However after spending some time evaluating a number of exported files, I have some real concerns regarding how Apple's new version, Aperture 3, is writing metadata, especially when these files are viewed by other applications in my workflow. My comments solely focus on how Apple Aperture handles embedded photo metadata, specifically on user-entered descriptive and rights-related terms defined in the IPTC Core schema. Like other software, Aperture 3 can read and write metadata stored in the older IPTC's older binary Information Interchange Model (IIM) and the XMP based IPTC Core. XMP Core support requires XMP support because it uses a sub-set of the old IIM's terms in addition to new terms that can only be stored using XMP. Many basic fields such as Captions and Keywords, Creator (Author), and Copyright Notice can exist in both the IPTC-IIM and IPTC Core, while other newer fields such as the Rights Usage Terms only exist in IPTC Core and these values are stored using XMP. You shouldn't be concerned if you use Aperture 3 on your own Mac, don't typically use embedded metadata, and don't share your images with others, or work with other programs such as Adobe Photoshop. Even if you do use metadata to describe your images, and only need to find them on your local computer, you should be fine. You should be concerned if you use Aperture to write metadata to files you use with other programs, share with others or share on the Internet. For example if you do additional work in Photoshop or Lightroom, and then archive your images using other programs, you need to understand what is happening, or risk having some or all of your metadata disappear. Other programs may not see the information you are adding to your images with Aperture, and if you are importing images that have been worked on in other programs, some of that metadata may not be recognized or stored within Aperture. 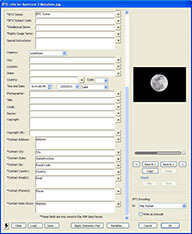 You should really be concerned if you are fully using the various metadata fields, such as the Rights Usage Terms, or Location fields, or geo-tagging your images, as many of these fields (and others), are not showing up in Photoshop, Adobe Bridge, Photo Mechanic, or Expression Media, after being exported from Aperture 3. If you are a stock or assignment photographer, or a photojournalist, then you should be concerned about what is happening with your metadata, as files exported from Aperture might be viewed as potential orphan works. This is because vital copyright management information may not be visible within an image file when a client is trying to find your contact information, or read the caption in order to know what is going on in the image. If you are concerned about the preservation of your embedded metadata, or have concerns about interoperability with other applications, then using Aperture 3 is certain to throw some obstacles in your path. Where and How does Aperture write Photo Metadata? The Apple engineers seem to enjoy pushing the envelope with new programs, but in order to fully take advantage of these advancements, you typically have to upgrade your hardware and/or update to the latest version of the operating system. Aperture 3 is no exception. With this release it's really essential to update your OS. If you don't, any TIFF, PSD, or JPEG images will lose, on import, most of the fields that first appeared in IPTC Core (which was released over five years ago). See the following Apple support page for details. Apple's Aperture takes a divergent approach to writing metadata. 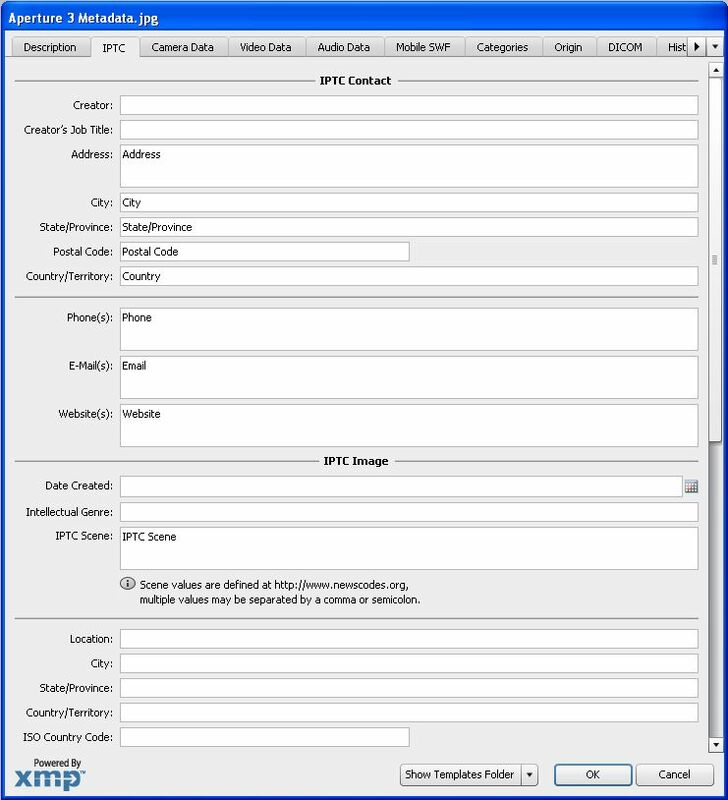 The vast majority of other applications, — such as those listed in the list of Software supporting IPTC photo metadata standards IIM and "IPTC Core" — write metadata values to both the XMP and IPTC sections within an image, for any field that exists in both schemas. In Aperture 3, new IPTC Core terms that can only be recorded using XMP are written to XMP — doing so doesn't create any problems. However, older IPTC Core terms inherited from the legacy IPTC set of terms are ONLY stored (written) using the IIM format. The problem with this approach is that many applications will only see one or the other (the XMP, or the IPTC-IIM) metadata written to an image file. Ideally any application reading embedded information should be able to see the metadata values regardless of where they may have been stored. Contrast this with the Adobe approach which is to have their applications write metadata to both the IPTC-IIM and the XMP; unless that information only exists in a newer schema such as the IPTC Core. It is interesting to note that Aperture 3 does suppport a number of legacy IIM fields that are not often used by other applications. Most of these values have never been supported by Adobe Photoshop, and if you open a file from Aperture that contains these fields, like "Edit Status" or "Category" it is unlikely they will be perserved after saving the file in Photoshop. As these are fields Which were "deprecated" (removed from service), that is not unexpected. Aperture 3 (and possibly Aperture 2 as well) also uses the IIM tag 1:90 to indicate UTF-8 encoding. This prevents characters beyond those in the standard ASCII set, to appear correctly, regardless of the platform which is used for viewing the metadata. In versions of Photoshop prior to version 7, letters like á, é, í, ó, ñ, or even © might appear very differently if written using a Mac and then viewed on a computer using the Windows operating system. View original image. 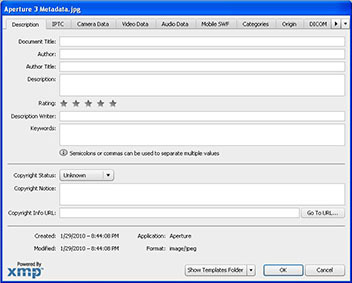 Little to no metadata is seen in Adobe Photoshop CS4 when you view a JPEG file which has been exported from Aperture 3. What is not clear is what will happen with image files that contain metadata written by other applications (especially extended or custom XMP metadata), when they are imported into Aperture, and subsequently exported. From some preliminary tests, any metadata outside of that entered in Aperture 3 appears to be stripped from the file. This violates the second and third principles of the Metadata Manifesto, namely that "Ownership metadata must never be removed." as well as "Metadata must be written in formats that are understood by all." I can't speak for others, but any application or utility that undoes work that I've already done is not desirable. In my book that makes work-slow, not work-flow as I'll have to re-enter my metadata a second time. Critics of Apple could certainly make the argument that while Aperture 3 takes one step forward (adding XMP support) the way that they have implemented this change takes two steps back in terms of interoperabilty with other applications. So at this point you are probably wondering what's not showing up in other programs. Unfortunately, that is not so easy to explain as the results differ by application (and even versions of applications), as well as by file format. However, the results do appear to be consistent for each specific combination. Where did my metadata go? Date Created, IPTC Scene and the Creator Contact fields -- those being: Contact Address, Contact City, Contact State, Contact ZIP, Contact Country, Contact Email(s), Contact Phone(s), and Contact Web URL(s). There is no Caption, no Keywords, no Rights Usage Terms, or even Instructions. And while someone finding this image might be able to call me if it included my phone number, they wouldn't know who to ask for when I picked up the phone! It may be easier to visualize what is/is not in the specific fields. To see that, click on the thumbnail below to see a full sized screen capture. If I open that same image using Photo Mechanic, (with preferences set to write metadata for an Adobe workflow -- as indicated on the Photo Mechanic support page, then I see exactly the same fields as above. Viewing the same file with Adobe Bridge for CS4, yields a different, and more positive result. Yet there are still a few fields missing, notably the Date Created, IPTC Subject, Intellectual Genre, and Right Usage Terms fields. JPEG = Jpeg file as exported from Aperture 3. TIFF-exported = TIFF file as exported from Aperture 3. DNG = DNG file as exported from Aperture 3. Raw-NEF = NEF files viewed after using the Write IPTC Metadata to Master in Aperture 3. Edit-in-ext-ed-TIFF = Opened using Edit in External Editor feature, then sized and saved as a TIFF in Photoshop CS4. Edit-in-ext-ed-PSD = Opened using Edit in External Editor feature, then sized and saved as a Photoshop PSD file in Photoshop CS4. Note that the TIFF files created via the Edit in External Editor option results in a display that is quite different from the TIFF files that are exported. It is important to note that the loss of GPS data in the TIFF is an issue with how Photoshop CS4 is writing metadata for that type of data — this is known issue with CS4 and all prior versions of Photoshop. It's unclear if Aperture 3, by only writing values to the IPTC-IIM location (rather than both IPTC-IIM and XMP) , is not conforming to the XMP specification. Or, is it possible that both Adobe (who wrote the specifications) as well as other developers like Camera Bits (who make Photo Mechanic) or Expression Media (originally developed by iView Multimedia, and now owned by Microsoft) all managed to get it wrong? Since Apple is a member of the Metadata Working Group (MWG) one would assume that this new version is abiding by the guidelines set out in that MWG's white paper Guidelines for Handling Image Metadata. If that is so, then it is possible that the other developers, such as Adobe are still in transition (since most all of their applications were released before the MWG released their guidelines). However, what's odd about this situation, is that Adobe and most all of the rest of the imaging applications manage to exchange metadata values with very few glitches or hitches — including newer metadata schemas that are stored in XMP such as PLUS. Writing out any IPTC metadata fields that exist in both the XMP and the IIM is consistent with the MWG guidelines and this is what Adobe has been doing all along. One could make an argument that Photoshop CS4 is the problem in this instance, since it manages not to display most of the IPTC-IIM that Aperture 3 has written to the exported JPEGs and TIFFs. However, there are also inconsistencies with how other CS4 components (Camera Raw and Bridge) read the same files from Aperture (as noted above CS4 was released prior to the MWG Guidelines being published). In addition Photoshop CS3 and CS4 read all the IPTC and XMP from other software just fine (at least other Adobe applications such as Bridge and Lightroom, as well as Photo Mechanic and Expression Media). It may be possible that an MWG-compliant metadata reader might see all of Aperture 3's IPTC metadata (both IPTC-IIM and XMP), but since none of those exist at present; it is hard to know for sure. Even if Apple Aperture 3 is compliant with the MWG guidelines, it's hard to imagine that the Apple engineers didn't do any testing to see what would happen if you open files exported by Aperture into other programs. If there was a beta test, it's hard to believe that not a single one of the beta testers noticed this issue. I know from other reviews I've read that at least one National Geographic photographer was included in the development of this release, I would have thought that metadata was something they would find important. Is this Apple's attempt to keep their customers locked-in and within their walled garden? Did they test for interoperability and/or simply not care about other programs? I hope that is not the case, but the results could lead you to that conclusion. Aperture appears to ignore any XMP outside the IPTC Core properties, and use of the "Update IPTC in Master" feature actually removes XMP metadata from master files which had been added with other programs. As one example, simply updating a master file in the Aperture database would inadvertently remove any PLUS metadata and IPTC extended properties, as well as Adobe Camera Raw settings. If you intend to use both Aperture and Lightroom you will either want to work on separate copies of the files (one file for each program), or decide only use one of them for actually updating files on disk. It is not possible to set the Copyright Status pull down to "Copyrighted" within Aperture, as this is not part of the IPTC or IPTC Core. For details on why this should not be of major concern see the article "Is Copyright Status Important?" on this site. 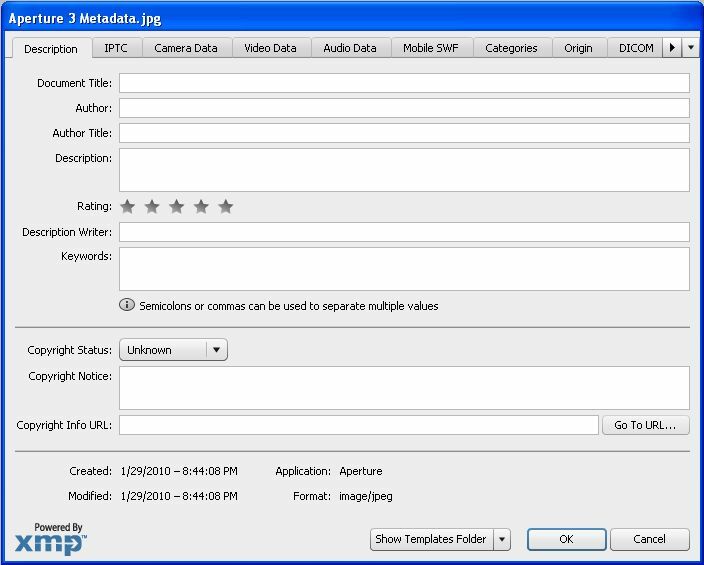 Aperture uses a number of non-recommended metadata mappings. The IPTC Subject Code is mapped into an IPTC-IIM field called "Subject Reference" and the "Intellectual Genre" field is mapped "Object Attribute Reference" field. As those are not the recommendations in the IPTC Core specification, and since Aperture 3 is not writing those into XMP, this will create a real interoperability issue for any photographer that chooses to use them. When you export your proprietary Raw files from Aperture 3, there are two options and one of those involves writing metadata directly to your original Raw file. Even if you discount the possibility of file corruption, writing metadata into the proprietary RAW file will create problems if you "round-trip" your metadata to other programs that use XMP sidecars. 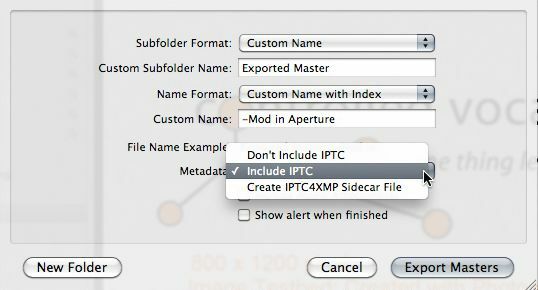 If you do use Aperture to write metadata — especially if you may be moving files to an Adobe workflow in the future — be sure to use the option to "Create IPTC4XMP Sidecar File" as this method seems to provide better results with more applications. Better yet, work with DNG files instead of the proprietary Raw formats, as these do an even better job of preserving metadata between applications. See the Aperture 3 Exported Fields spreadsheet for a comparison of the differences between DNG and Nikon NEF files. Aperture 3 incorporates facial recognition (the Faces feature similar to that in iPhoto) however; this information is not embedded into the image. So this information is not useable by other programs unless you manually transfer this information (such as people's names) to the keywords or other metadata field. GPS appears to be embedded properly for both JPEG and TIFF files, though DNG, and probably RAW files don't appear to have this info accessible once you leave the program. Aperture is only available on the Mac platform. If you are a Windows-only computer user, you are out of luck. And depending on which survey's you find most accurate, that either means that 65 percent of professional photographers won't be able to use Aperture (according to a Professional Photographers of America survey); or 52 percent of photographers (those that replied to The Digital Photography School survey as that was how many respondents indicated that they were not on the Mac platform). If you don't use the Date Created, IPTC Subject, Intellectual Genre, or Right Usage Terms fields, you can add some additional info with Adobe Bridge (this could be something as simple as assigning a star rating or color label). When Bridge updates the XMP and IPTC metadata for the image, then you'll be able to see most if not all of those fields when you open the file in Photoshop, or add metadata with Photo Mechanic. Another possible work-around may be to use Aperture's option to export an XMP sidecar, and then use this as a template in Photoshop or Bridge. So long as the XMP file is written correctly, there's a chance that those fields appearing in both XMP and ITPC-IIM would be synchronized. This certainly means additional labor, but if the results are better than the engine being used in Aperture to embed the metadata it would be quicker than having to determine which fields didn't show up and had to be re-entered. A final option would be to not apply metadata in Aperture at all, but wait until after your images have been toned and color corrected. Export the files from Aperture 3 as a TIFF, or PSD, and then use a program known for writing metadata that can be read by all major applications. If Apple expects Aperture 3 to be accepted as a tool used by professionals, then they need to recognize the environment in which professional digital photos are being used. As pointed out in the Metadata Manifesto, "Lack of information about an image file can delay projects, necessitating additional research to establish licensing rights, obtain clearances, and confirm caption details. This in turn has contributed to the growing problem of misuse of images, whether through error or by intent. Without proper licensing or permissions, users infringe copyright and expose themselves to liability." To me, that means that metadata which I add to an image, regardless of which application may have first written it, must be preserved by all applications that follow. If this means that those subsequent applications must deal with "legacy" formats and all of the work that entails, so be it. If the application isn't up to this task, at minimum it should inform the user that some metadata may be lost. At least this way, the person using the application will know there is a problem and can find a way to address it, rather than find out after they may have processed thousands of images. There have been other comments on various websites suggesting various work-arounds that may be possible for those with small numbers of images. However the principal issue here is that this additional work should not be necessary. Recent releases of software should embrace current and future standards, but they should also acknowledge and respect previous standards as well. Adopting the use of new software should not require additional work on the part of the user to preserve or maintain the status quo. At this point in time, I'm not willing to invest time in learning a new program for processing my Raw digital camera files when there is such a disconnect in regards to metadata interoperability. I will have to pass, at least until the time comes when I can count on being able to enter metadata into Aperture and have ALL fields visible in the other applications which I currently use as part of my workflow. If you are using Aperture and want to do something about these issues, then be sure to report your problems to Apple. The more people they hear from the more likely they will escalate these issues and correct them. Derek Story has noted that Aperture 3.0.1 Fixes a Lot, but Not All , including the metadata issues mentioned above. Issues with Aperture 3 date created field noted on the MacRumors website. The Inside Lightroom site summarizes a number of reviews debates comparing Aperture 3 and the current version of Lightroom as well as the new beta of version 3. The MacInTouch website has a number of comments from Aperture users regarding metadata and other features.